My skin has gotten more sensitive as I've gotten older. Even in the past year I've noticed a big change in the way my skin reacts, so I've decided it's time to simplify things. I've been avoiding any makeup or skincare products with perfumes and have started using unscented laundry detergent. I even have to be careful about the lip balm I use! 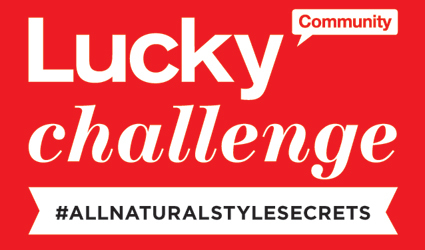 Just in the knick of time, I received this free sample of Hydrating Serum from Lucky Magazine and Seventh Generation. The new line of Seventh Generation's skin-boosting serums is so natural you could practically eat them! Seriously, there are 12 ingredients in the hydrating serum! It's hypoallergenic, won't clog my pores and contains absolutely no parabens, phthalates or synthetic fragrances. I apply it after I wash my face in the evening, since it's mostly oil-based. That way it has time to soak in and I don't have to walk around all shiney faced! In the winter, I'll probably mix it in with my lotion to avoid the crazy-dry skin I get in cold weather. Simplifying your beauty regimen doesn't have to be drastic, and if you're not having problems with rashes, like I am, it doesn't mean you have to throw away everything in your bathroom. Use up the products you have, then invest in some high-quality, earth- and skin-friendly products from Seventh Generation's new line. - Skip lip balms that contain peppermint oil. This is really irritating and can make chapped lips worse! - Having trouble getting smells out of your clothes? Switch to natural fabrics! Polyester and synthetics tend to stay smelly, even after several washes. Plus, they usually make you sweat, and we all know what that leads to! - Remove heavy makeup by applying a few drops of olive or jojoba oil to your face. Let it soak in, wipe with a tissue, then wash as usual. Frida's gettin' back to basics, too. Hi.. I love this post.. your tips are great and I agree with your search for natural products!!! my skin also gets more sensitive as i get older! *sadness* that's why i have been trying to stick to natural oils, natural skin products & mineral makeup for the past couple of years. i must say, it pays off. i would love to try this seventh generation's skin-boosting serums as it sounds terrific! You know I love the all natural skincare products. Great review! I'm SUPER sensitive too, I'll have ta check this out! You look absolutely stunning in these photos! The product is very interesting. And ur dog is soo adorable!